Michelle Pereira: Tales and Weaponry. - Oddments Journal. Michelle Pereira: Tales and Weaponry. When in Melbourne, there are certain things you can count on—unpredictable weather (and then some), excellent coffee, and that Off the Kerb gallery in Collingwood is bound to bursting with artwork that’s sure to thrill—to name just a few. Panther, 2018, Michelle Pereira. Courtesy of the artist. All Rights Reserved. As should come as no surprise, the October slate of exhibitions at OTK is just as splendid as always, with local artist Michelle Pereira’s debut solo showing in the Side Gallery shaping up to be a particular highlight. 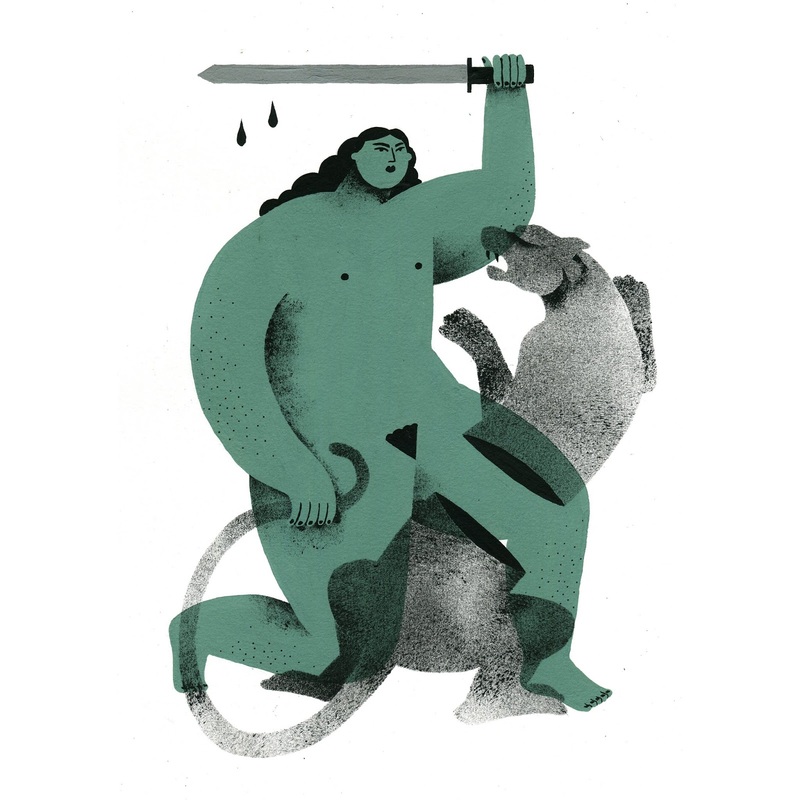 Intriguingly titled and made up from a bold collection of illustrations, Pereira’s Tales and Weaponry takes a playful, and powerful, look at tales, rhymes, and WWW—or, Women Wielding Weapons. 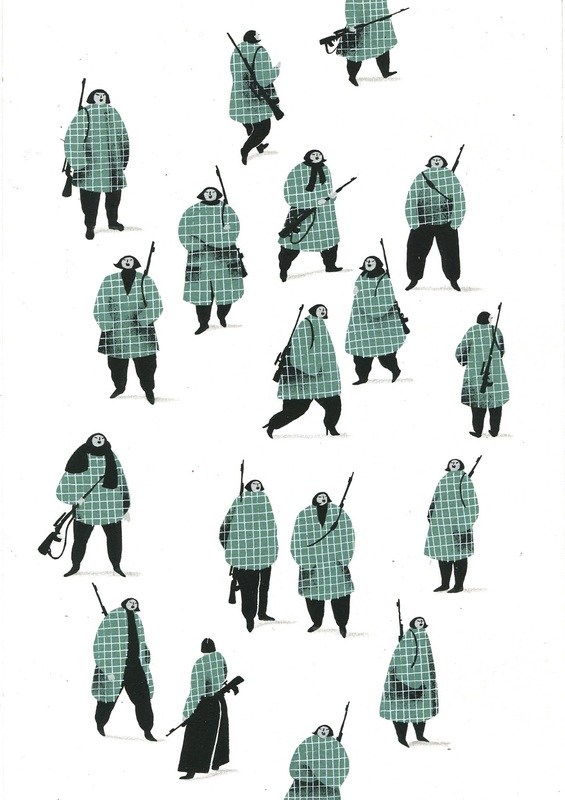 Rifles, 2018, Michelle Pereira. Courtesy of the artist. All Rights Reserved. Pereira’s drawings are humorous but forthright. The women who inhabit her striking works are spirited and indomitable, evocative of Grecian silhouette figures—excepting, of course, that Pereira’s characters are fully fleshed out and brimming with liveliness. We had a chat with Michelle about her inspirations, how one goes about modernising classical art, and which podcasts are the best to paint to. 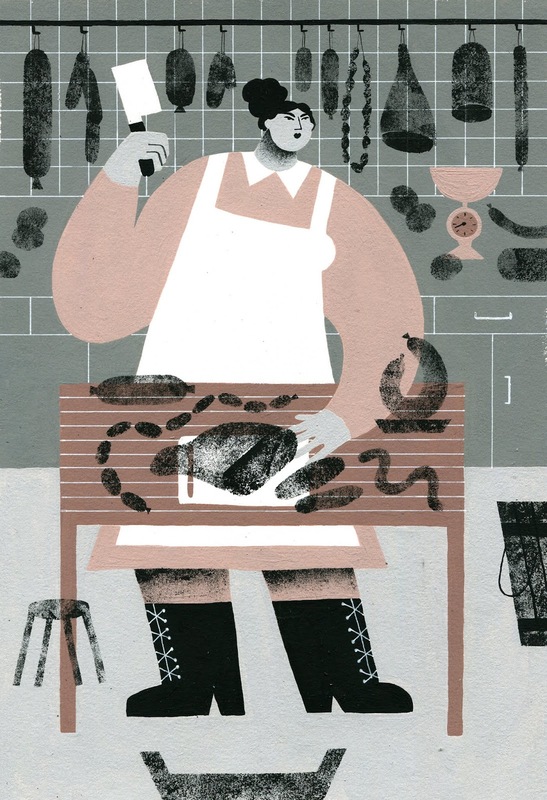 The Butcher, 2018, Michelle Pereira. Courtesy of the artist. All Rights Reserved. First of all, tell us a little bit about Tales and Weaponry—what was the inspiration behind the collection? Like many children, one of my favourite things to do when I was younger was to read stories and fairytales. My all-time favourite book was a somewhat dark collection of not-so-watered-down Brothers Grimm tales, complete with unsettling illustrations and — I later discovered as an adult — unaltered endings. It was a great book, and I found it absolutely thrilling. The Tales part of the collection is an ode to that time. The Weaponry part is is simply because I’m enjoying painting women with weapons at the moment. Now, I can see a quite distinctive likeness to Grecian figure art, which, of course, predominantly depicts the bravado of men. Is that deliberate? It is! I like referencing classical paintings and replacing everyone in them with my women. Just some playful subversion. When you’re referencing classical work, especially when you’re putting such a modern spin on it, how do you exert your own identity and reinterpret the art to make it your own and better serving of your overall intention? For me, it primarily involves centralising women in my pieces. Tell us a little bit about your process—how did the pieces in Tales and Weaponry come together? Do you start with a sketch and build up, or do you just attack a blank page and go for it? And what significance does the palette play in the overall theme? I mostly start off with a few thumbnail sketches, just to figure out proportions and composition. Then I move to the blank page, plug into a podcast that has heaps of episodes, and get painting. When did you first realise you were artistic and wanted to do something creative? I realised I was artistic when I was quite young. I was always drawing, painting or making things — or reading creepy Brothers Grimm tales. I wanted to pursue the creative field as an adult, which led to me becoming a Graphic Designer. Unfortunately, that experience completely destroyed all the joy that creativity had previously given me and sadly, when I quit my design job after two years, I also stopped painting for the next five. It was only about a year ago that I rediscovered how happy and fulfilled being creative made me, and now I’m back at it again. Hopefully for good this time. What inspires you, just in general? This collection is quite obviously saying something—it’s a feminist statement. What or who inspires that kind of curiosity in you? I’m currently very inspired by a bunch of contemporary illustrators — Grace Weaver, Bryce Wymer, and Rob Sato are a few of my favs — traditional Arabic and Indian art, this podcast I like to listen to called Blindboy, and anything to do with animation. As for the feminist statement — at this moment in time, feminism is culturally very present, and as a woman, I think that inevitably that would be reflected in my work. It’s far from a manifesto, but I have made a conscious decision to depict my women as strong, powerful, and often brandishing weapons. Snake, 2018, Michelle Pereira. Courtesy of the artist. All Rights Reserved. Thanks to Michelle for taking the time to chat with us. Michelle Pereira’s Tales & Weaponry will be on view at Off the Kerb from September 27 to October 11, 2018. You can follow Michelle Pereira and see more of her work on Instagram.